Knitting has its own language. UnFinished Objects become UFO's. A frog in a pond says "rip-it, rip-it" and so "frogging" has come to mean ripping back -- unraveling -- knitting. 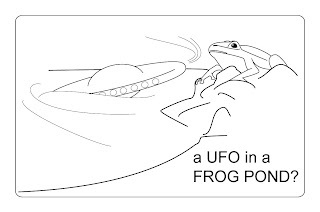 You can put a UFO into the frog pond, and most US knitters will know that you have unraveled a partially knitted project, although to a non-knitter this means, well, something different. knit 1, then purl 1, then knit 1, then purl 1, then knit 1, then purl 1, then knit 1, then purl 1, then knit 1, then purl 1, then knit 1, then purl 1, then knit 1, then purl 1, then knit 1, then purl 1, then knit 1, then purl 1, then knit 1, then purl 1, then knit 1, then purl 1, then knit 1, then purl 1, then knit 1, then purl 1, then knit 1, then purl 1, then knit 1, then purl 1, then knit 1, then purl 1, then knit 1, then purl 1, then knit 1, then purl 1, then knit 1, then purl 1, then knit 1, then purl 1, then knit 1, then purl 1, then knit 1, then purl 1, then knit 1, then purl 1, then knit 1, then purl 1, then knit 1, then purl 1, then knit 1, then purl 1, then knit 1, then purl 1, then knit 1, then purl 1, then knit 1, then purl 1, then knit 1. Knit 1, then purl 1, then repeat these two stitches 28 times more. End up by knitting 1 stitch, and then you are at the end of the row. *k1, p1, repeat from * 28 more times, end with k1. In this version, stars * * are used as the signal to enclose the action to be repeated. In other words, the stars surround the action to be performed --k1, p1--and you do that action 29 times altogether. One stitch will be left, and you knit that last stitch. * k1, p1, repeat from * 28 times more, end with a k1. In this notation, the star indicates the beginning of the action, and the word "repeat" indicates the end of the action, as well as telling you what to do next. What in the world does THAT mean? Well, the same principles apply. The first thing to do is to p1. Next comes a set of instructions encased in parentheses ( ). The notation "2 times" after the close of the parentheses indicates that you are to do everything within the parentheses 2 times altogether. Within the parentheses are THREE sets of instructions, each of which is encased in stars: the first is k1,p1, which you are to do 2 times; the second is p2, k2, which you are to do 2 times, then you are to do a single p2. Finally, you are to end each section with two repetitions of p1, k1. The point of the ( ) symbols is that you are to repeat everything inside the parentheses 2 times altogether. After the two repetitions, the row ends with a single p1. Knitters accustomed to these sorts of instruction can see this row clearly laid out in their mind's eye. This is a row of ribbing knit flat (back and forth). The row starts and ends with a p1. The rest of the row is divided into 2 sections. Within each section there is a center section of 2x2 ribbing (the middle set of stars), and this center section is flanked by 2 outer sections of 1x1 ribbing (the 2 outer sets of stars). Further, the 1x1 ribbing backs up to the 2x2 ribbing in such a way as to create 3 p's in a row. These sorts of instructions are perhaps not very user-friendly when you first see them. To add to the confusion, knitting is created from right to left, and from bottom to top, whereas English is written from left to right, and top to bottom. So, seeing this sentence fragment as a knitted row in the mind's eye requires not only decoding the abbreviations and symbols, but is also transposing left with right and up with down. If you plug away at this, you will get it. But in the meantime, if you'd like a more graphic representation, perhaps you will consider charts. Below is the same stitch pattern as above, laid out in both writing and in chart form. 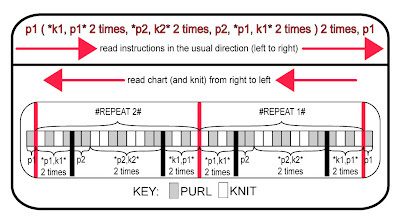 As shown by the arrows, knitting charts are meant to be read in the same direction as knitting is created: from right to left. Many knitters find such charts easier to read because the pattern is laid out graphically. For example, the alternating sets of ribs are now plainly displayed. 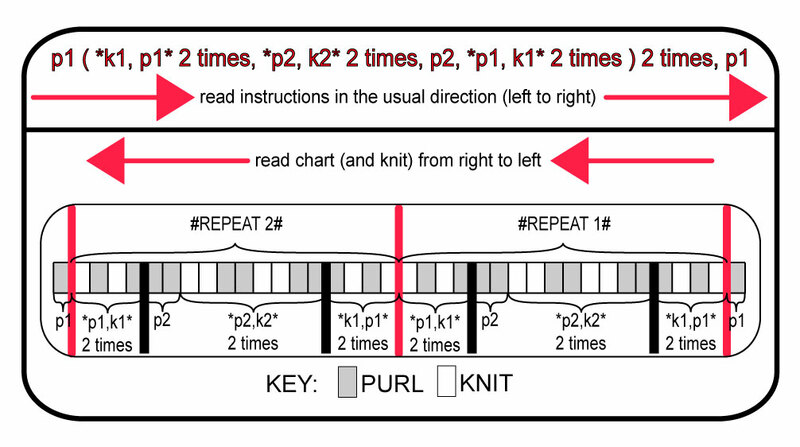 In this chart, knit and purl are shown by different colors, but other symbols also appear : a blank white square for knit and a bar - for purl is common; as is K for knit and a P for purl. Nearly all charted patterns have a key to make all clear. For more information on reading charts and shorthand, click here. A POLL with a chance at a PRIZE! QUICKtip on conditioning knitting needles.